This is one of the South African salvias which are so useful in Australia. It is an evergreen very hardy to cold and drought. Mostly it is rather straggly grower but a bit of cutting would thicken it up. It is about 60cm high. 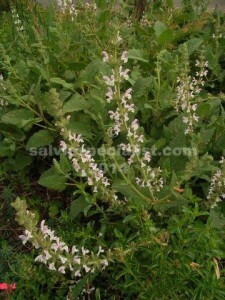 Flowers are white which is a good thing as there are not a lot of white salvias. Pic A.. A pale pink plant I introduced as eigii but now called pink disermas grows differently. 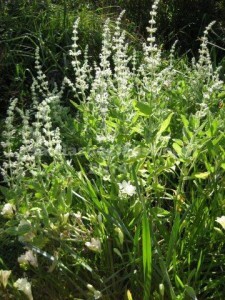 It has a solid central growth which can be up to a metre after a couple of years and spikes of pale flowers particularly in late winter and spring for me but in milder climates it flowers less at a time but year round. White disermas is probably best in sun , pink disermas will tolerate some shade. 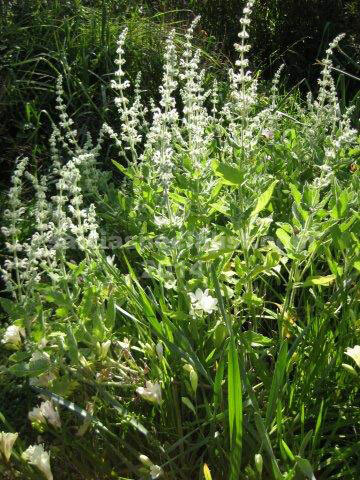 A somewhat similar but more striking, also African, plant is radula – white flowers.